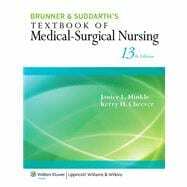 Prepare for medical-surgical nursing practice and success on the NCLEX with Brunner & Suddarth's Textbook of Medical-Surgical Nursing, 13th Edition. A favorite resource for students and practicing nurses for almost a half-century, this book provides comprehensive yet accessible coverage of a broad range of medical conditions while focusing on the nursing process and the nurse’s role in caring for and educating patients and families within today’s complex health care delivery system. NEW! Concept Mastery Alerts clarify difficult concepts, informed by data from Misconception Alert questions in PrepU for Brunner & Suddarth's Textbook of Medical-Surgical Nursing, 12e. NEW! Quality and Safety Nursing Alerts build upon previous edition’s Nursing Alerts to highlight issues related to quality and safety nursing care. NEW! The updated unit openers include new Case Studies with QSEN Competency Focus to highlight a competency and related knowledge, skills, and attitudes. Additional information for these case studies related to NANDA-I, NIC, NOC and the nursing process is available online. NEW! Prioritization Questions have been added to the Critical Thinking Exercises. UPDATED! Genetics Charts and Ethical Dilemma Charts have been revised to reflect the latest advances in the field. UPDATED! Critical care information has been updated to further the authors' goal to have the most up-to-date and clinically relevant content on critical care throughout the book. EXPANDED! Expanded coverage of obesity, highlighted with a new icon, focuses on this epidemic health problem in our society. STEAMLINED! The Table of Contents has been reorganized for a more logical sequence and flow. REVISED! The accompanying Study Guide now features reorganized content and revised questions.